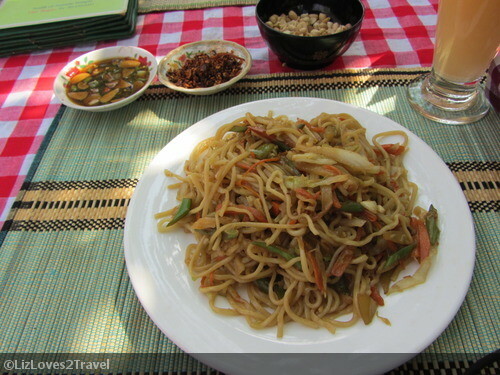 It's impossible for you not to get famished after visiting a whole lot of temples in Bagan. Before heading back to the guesthouse, Mihn drove me around so I can choose where I want to eat. The first place he told me to try was serving buffet. But I'm all alone and it's not fun eating a lot when you have no one to share the experience with. I checked around 3-4 restaurants in the area (and their menu) before I found the "one". 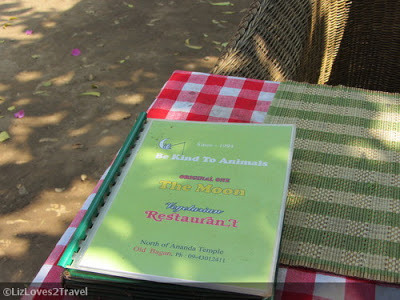 I chose to eat at The Moon Vegetarian Restaurant. Nope, I'm not a vegetarian. I just found the food on their menu appealing to my taste. And the place itself looked perfect for me. 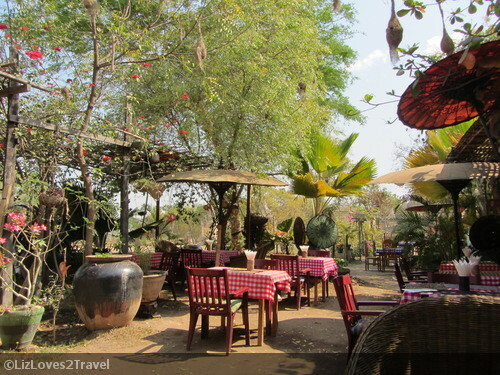 Al fresco dining, I loved it. 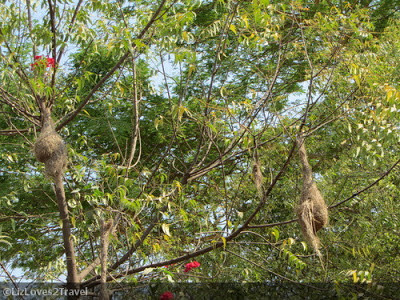 The trees, the birds nests hanging on them, the flowers, the jars, the parasols. Totally exquisite. I was immediately greeted with a smile by one of the waiters. Just as what I observed in the restaurants in Bagan, they will serve you with a bowl of roasted peanuts first. Eating them was nice while waiting for your main dish. I can't say that this is in all of Myanmar because I didn't experience it in Yangon. They don't just have the usual beverages you'll find in a regular restaurant. 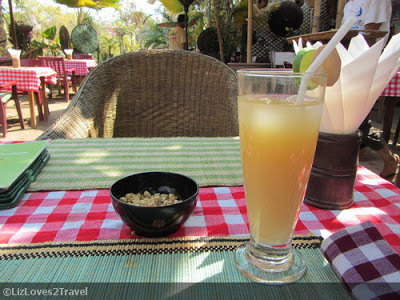 The waiter noticed I was having a hard time selecting my drink, so he suggested that I try their Ginger and Lime Juice. I'm that person who always likes to try new things so I said "okay". Even though at the back of my mind, I was a bit writhing about the idea of drinking a ginger juice. But he said, it's very good for digestion (not that I have indigestion). But yeah, I made up my mind. I was craving for noodles that day. Not the usual noodle soup though, because the weather was so hot. I got the stir-fried one. It was freshly prepared and it didn't take too long for them to serve. It came with vinegar with green peppers and some chili for additional oomph. It tastes good although a bit too salty for me. Maybe it was just my saltiness level preference. The serving was generous. I actually didn't finish it, that I had to take the left over. The price for me was affordable. It was more expensive than those you can find at the Main Road in Nyaung U, but considering the location and the very relaxing atmosphere, it was reasonable. 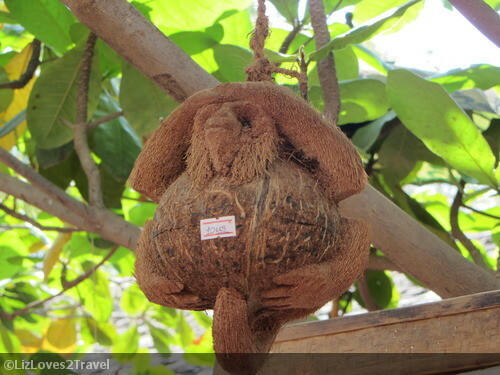 They also sell cute handicraft souvenirs like that hanging monkey up there. I know it's so cute but very expensive at USD 40. The ginger and lime juice got me excited! I'm so obsessed with ginger. The noodles look yum. It does look like a monkey, to be honest..